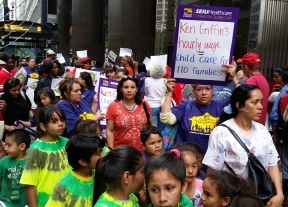 Families, child care providers and community members frozen out by Governor Rauner’s orchestrated budget crisis delivered a strong message to the Governor Wednesday morning with a visit to his friend and $13-million-dollar donor, Ken Griffin: the state should force billionaires and millionaires should pay their fair share of taxes instead of inflicting devastating budget cuts on working families. The message took place outside the Citadel Investment Group, 131 S. Dearborn. On July 1st, the Governor frozen enrollment in the Child Care Assistance Program to 90 percent of previously eligible families. So far, an estimated 3,500 families have lost access to the care that allows parents to work to support their children. The result is parents losing their jobs and access to safe, reliable care. With Governor Bruce Rauner’s refusal to work with the state lawmakers to pass a responsible budget that protects Illinois families, parents and child care providers are taking their pain to the doors of Citadel Group, and asking CEO Ken Griffin to provide the child care that he’s refusing to fund.